Find artworks, auction results, sale prices and pictures of Robert J. Fr. Faust Lefevre at auctions worldwide. each 25 1/2 by 21 in. ; 65 by 53.5 cm. The right and center works oil on paper mounted on canvas; the left oil on canvas, mounted together in a period giltwood frame. In response to your inquiry, we are pleased to provide you with a general report of the condition of the property described above. Since we are not professional conservators or restorers, we urge you to consult with a restorer or conservator of your choice who will be better able to provide a detailed, professional report. Prospective buyers should inspect each lot to satisfy themselves as to condition and must understand that any statement made by Sotheby's is merely a subjective qualified opinion. Holdernesse House (later Londonderry House) inventory, 1834, one of the two portraits of Napoleon listed in the Boudoir (no. 23). Holdernesse House inventory, 1851, p. 82, one of two portraits of Napoleon (in oval frames) listed in the morning room (probably the room listed as the boudoir in the 1834 inventory). 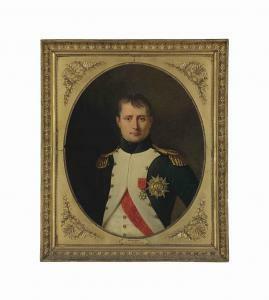 Londonderry House inventory, 1886, p. 95, listed in the large dining room \‘oil paintings in gilt frames\’\’\’\’ \‘half length portrait of Napoleon 1st by R. Le Fevre, 1805\’\’\’\’. A. Hicks, David Hicks – A Life of Design, New York, 2008, p. 107, illustrated in situ in Lord Londonderry\’\’\’\’s dressing room at his Hampstead home, circa 1965. 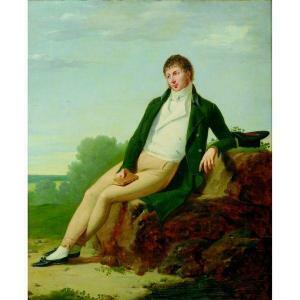 ROBERT-JACQUES-FRANCOIS LEFEVRE (BAYEUX 1755-1830 PARIS) Les callipyges grecques signé et daté 'Robt. lefèvre fecit. 1802' (en bas à gauche) huile sur toile 60,5 x 48,5 cm. 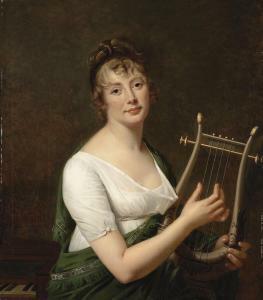 Salon de 1802, n. 245. Anonymous sale; Christie's, Monaco, 30 June 1995, lot63. New York, Colnaghi, The French Portrait 1550-1850, pp. 67-8 and101, pl. 18.